One of the things I wanted to get involved with once I settled in Atlantic Canada was to engage with the IT Architecture community. I wanted this engagement to be at the grass-roots level where the focus is with deepening the skills and knowledge of existing architects and encouraging senior developers to broaden there skills and knowledge into architecture. I see the group starting in St. John's and quickly reaching-out to other areas of Atlantic Canada. To facilitate the geographic distribution I believe we could use many of the on-line tools available to facilitate community engagement. My time with Mozilla, WikiEducator and CLE taught me much about facilitating online community and distributed work teams. I really don't want to build this on my own, so if others know of similar activities I would really appreciate being pointed in there direction. I was thinking we could name the professional group the Atlantic Canada Association of IT Architects (ACAITA). It would be very agnostic toward which of the existing professional IT groups it would align itself. The ACAITA would aspire to have associations with all related professional associations. 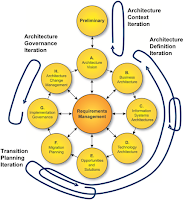 I also don't believe it should focus on any particular architectural framework or process. The group should work diligently toward building skills and knowledge of all frameworks and processes. I am open to changing this schedule, maybe even having meetings during the day rather than in the evening. Or providing a mix of both. This is a collaborative effort and what the membership agrees to is what we could move forward with. All good. Agenda: Introductions, Frameworks and Groups, What are the different roles of the architect? December 19th - Whats available for the Architect?